In the larger world of shellfish, cockles are easily overlooked. These coin-sized mollusks are diminutive in comparison with clams, mussels and their other bivalve kin, but they are cherished nonetheless because of their fine flavor. They can be spotted easily in your fishmonger's display, looking much like a small clam but with a distinctive, deeply ridged shell. 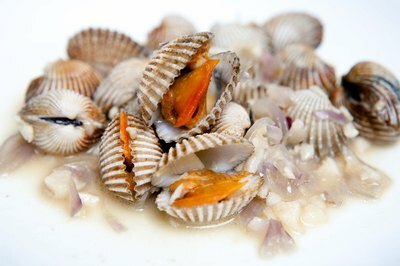 As with most other small shellfish, they're generally steamed before eating. Cockles are filter-feeders, like most of their kin, which means they often contain grit from their tidal environment. If you've harvested your own -- always check with local authorities, to ensure no prohibitions exist against harvesting shellfish in your area -- store them overnight in a bucket of clean seawater with cornmeal at the bottom. They'll siphon out the grit as they rest. If you've purchased your cockles from a fishmonger, a container of mildly salted water will have to do. 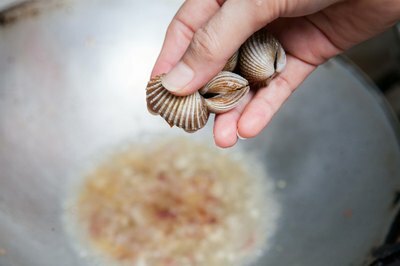 If their shells show grit or debris in the grooves, scrub them with a soft brush immediately before cooking them. One way to steam cockles in meal-sized portions is in a steamer basket. Use a Western-style steamer insert inside a large pot or a drum-shaped Asian bamboo steamer over a pot or wok. Arrange the cockles loosely in your basket, discarding any that don't close when tapped, and bring the pot to a boil. After 3 to 5 minutes' boiling, remove the lid -- carefully avoiding the hot steam -- and look at the cockles. They should now all be open, and you should discard any that haven't opened. Eat them as-is, with a drizzle of lemon juice, or add them to your favorite dishes. 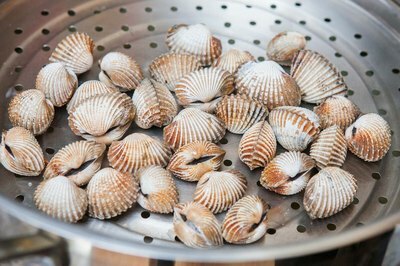 You can add subtle flavor to the cockles by adding fresh herbs, spices or a splash of wine to the water. A related method, suited for smaller portions of cockles, demonstrates more finesse. Saute aromatic ingredients such as shallots and garlic -- or ginger and lemongrass, for an Asian variation -- in a skillet; then add broth, white wine or a similarly flavorful liquid. Once the liquid comes to a boil, add your cockles and cover the pan tightly with a lid. 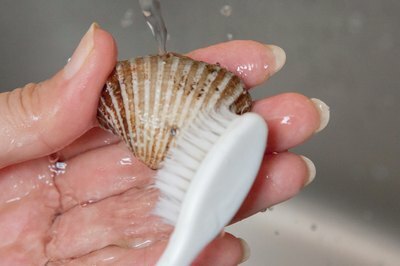 After 3 to 4 minutes' steaming, remove the cockles and discard any that haven't opened. Serve the cockles with their cooking broth, or enrich the broth with heavy cream or butter to make a full-blown sauce. Some dishes provide an opportunity for the cockles to simply be cooked in place, as part of the meal. 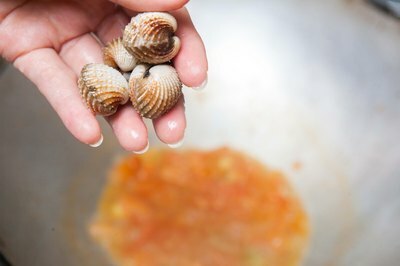 For example, cockles with scrupulously clean shells can be added directly to the pan as you cook a batch of paella or risotto. As the rice simmers, the cockles will open and contribute to the flavor of the finished rice. If you're making a fresh-tomato sauce in a large skillet, add cockles once the tomatoes have softened and their moisture has begun to evaporate. When the cockles open, spoon the sauce and the tender shellfish over your cooked pasta and garnish them with freshly chopped herbs.